This is a foreign exchange guide to Spain, the Euro currency plus EUR transfers and travel tips. There’s always an excuse to visit Spain… whether it’s for the glorious sunshine, lazy-day siestas or soaking up those beautiful sights – the whole country is a open book of experiences that are definitely too beautiful to resist. The Pyrenees and the Picos de Europa are as beautiful as any mountain range on the continent, while the snowcapped Sierra Nevada rises up improbably from the sun-baked plains of Andalucía; these are hiking destinations of the highest order. The wildly beautiful cliffs of Spain’s Atlantic northwest are offset by the charming coves of the Mediterranean. And everywhere you go, villages of timeless beauty perch on hilltops, huddle in valleys and cling to coastal outcrops as tiny but resilient outposts of Old Spain. That's where the country's charms are most likely to take hold. Windswept Roman ruins, cathedrals of rare power and incomparable jewels of Islamic architecture speak of a country where the great civilisations of history have risen, fallen and left behind their indelible mark. One of the best aspects about visiting Spain though is the sheer diversity you can find all across the country – the cultures, food and even languages can change quite dramatically depending on where you find yourself in Spain. This of course only adds to the excitement of visiting and re-visiting Spain as each time afford you the possibility of having a fantastic new experience in a familiar place. The Spaniards love visitors, hosting strangers, drinking good wine, laughing at a good meal, and enjoying life. A fiery, passionate place, this country will stay withy you forever and, unlike other Western European countries, will be a lot kinder to your wallet. What currency to use in Spain? The euro is the only currency accepted in Spain, and it is unlikely you'll be able to use anything else, even in the airport. It may be possible to exchange old Spanish peseta notes in a bank, but the easiest way to get Euros is to use an ATM. ATMs are available everywhere in the larger cities, in the smaller towns you may have to walk a bit to the nearest one. Pickpocketing is something to watch out for in Spain, so instead of carrying your main credit card on you purchasing a Prepaid Travel Card before leaving home may save unnecessary hassles. Most of the major cities have excellent local transport. Madrid and Barcelona have extensive bus and metro systems. Other cities and provincial capitals all have reasonable bus networks. You can buy single tickets on the buses or at estancos (tobacconists), but in cities such as Madrid and Barcelona, you are better off buying combined 10-trip tickets that allow the use of a combination of bus and metro, and which work out cheaper per ride. These can be purchased in any metro station and from some tobacconists and newspaper kiosks. Most travellers in Spain don’t get city passes, but if you plan to do a lot of city sightseeing, they are a good investment. All the major cities have multiple museums, attractions, and activities. Getting a city pass can save you up to 20% on these activities and get you free transport. If you are going on a sightseeing binge, get the pass! Madrid has the countries most extensive metro train network, the other cities have reasonable but useful metro trains. The bigger cities have plenty of Taxis, but not so in the smaller towns. 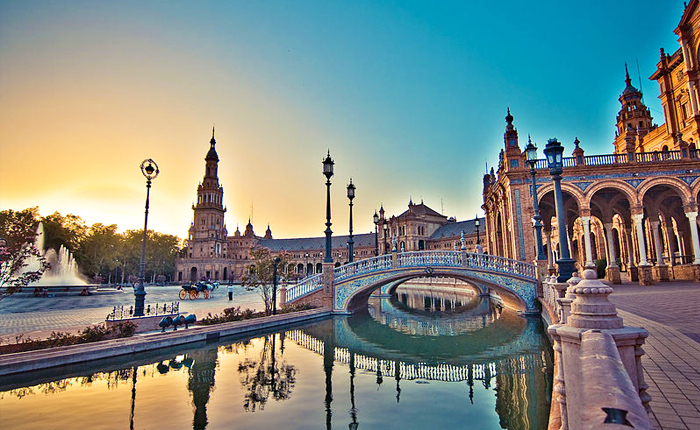 There are some pretty beautiful cities in Spain, including but not limited to the amazing; Valencia, Madrid, Barcelona and Granada, but don’t think the cities are all there is to see! The beautiful Mediterranean coast, mountainous Basque region and the plains around Madrid all provide ample stomping ground for us travellers to see and explore a different aspect of this stunning country. Most people understand at least a little English in Spain, most of the younger generation are fluent. A siesta is a pretty big deal in Spain… and rightly so! Usually, around 1-4pm, many shops, offices and restaurants will shut their doors for a little afternoon kip. Take advantage of this time to chill-out and relax… or even enjoy a cheeky siesta yourself, after all it’s your holiday! One thing to note (especially if you’re not from Southern Europe) is that dinner is usually much later than its Northern European neighbours. Dinner will usually start around 10pm for locals and can last a good few hours. Food is not rushed and is an amazing opportunity to socialise until the wee hours in your new local haunt. When searching around for information on how to get a good exchange rate when sending money to Spain you need to start with finding out the latest Euro foreign-transfer exchange rate. Overseas buyers investing more than 500,000Euros in Spanish property are automatically eligible for a residency visa. For non-EU citizen purchasers, permission for permanent residence can be obtained by opening a spanish bank account with more than US$150,000 and owning a business. Look to spend 8-14% of the property value on buying costs, with legal fee around an additional 2%. Once your funds are received by the provider the converted EUR amount will be transfered to the recipient account you specify in Spain.